Comprehensive review of Famous Dave's Moisture Tan. See what the experts and actual users have to say about this self tanning product. Famous Dave’s Moisture Tan is one of the better self tanners available today. It’s a simple formula that produces a nice color, doesn’t smell bad and lasts for 4-6 days. The only negatives of this product may be the fact that it doesn’t have any tint, doesn’t get super dark and may be a little ‘thick’ for some. Overall though this one isn’t a bad choice for those who want a clean, lighter-colored tan. Famous Dave’s Moisture Tan comes out as a white, almost chalky lotion. It’s one of the thinker self tanners we’ve reviewed. Applying this product is about average compared to other self tanning products. It doesn’t have any tint or color guide to it, which some people like and others don’t. The downside of no tint is you need to be a little more careful in making sure you’ve covered everywhere that needs to be covered. If you miss a certain spot, you’ll have no way of knowing with this product. The thickness of this product may be a concern for some people (making it harder to blend in), but for us it wasn’t a big deal. 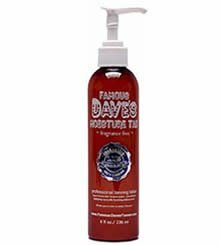 Famous Dave’s Moisture Tan dries a little quicker than most other lotion-type products, but it does take some time. As it’s drying, it doesn’t feel too bad although it is a tiny bit greasy. When you combine it’s drying time and the fact that’s it’s white, you really don’t have to worry about this getting on your sheets. which is a major plus! This product’s smell is best described as ‘neutral’. It doesn’t smell bad– in fact, it kind of smells like aloe vera. The smell mostly went away after application and we didn’t notice very much of the ‘self tanner smell’ that people are so appalled by. The faint trace of odor wont bother too many people. Famous Dave’s Moisture Tan produces a pretty nice shade of bronze. It may be a little light for some, but if you’re light-skinned this may be a good one to try. We didn’t notice any significant orangeness, streaking or blotchiness with this product. This product lasted about 4-6 days, which is pretty good compared to most self tanners. One thing we did like, when it faded, it wasn’t too blotchy and patchy like with some other products. Yes, this one is definitely guy-approved. It doesn’t have a lot of tint to it and the smell is neutral. Famous Dave’s Moisture Tan appears at first glance appears to fall within an ‘average’ range price-wise ($26.97). But for some reason, they charge $7.90 for shipping, which is kind of ridiculous. It doesn’t cost anywhere near $7.90 to ship a simple 8 ounce bottle (except to Alaska or Hawaii maybe). They’re clearly profiting off the shipping charge. So when you add that in, you’re looking at $34.87 per bottle for an 8 ounce bottle. That works out to $4.35 an ounce, which isn’t too bad even including the silly shipping charge. To buy Famous Dave’s Moisture Tan, click here.